It’s time to go back to school after winter break, and that means… free time to blog about my vacation! I spent two weeks in Vietnam, reuniting with my sister and experiencing everything the motherland has to offer. The food was wonderful and everything was crazy cheap! Nha Trang beach was beautiful and Saigon’s traffic was the most insane I’d ever seen. I can’t wait to go back! I got into Saigon (Ho Chi Minh City) late Saturday night, and my sister was there to pick me up. It sure was great to see a familiar face after a long flight! After putting up my things, she took me to get something I’d been craving for a while: snail in coconut milk. My mom had warned me to be careful and start off eating only mild foods, so that sounded about right. Ha! We got a variety of snail dishes and everything was unbelievably delicious! Then we went to a second restaurant for dinner part two. It was glorious. Sunday morning meant mass – and Vietnamese people start early. Mass at 7! Unheard of. The service was nice, though, and the early sun rays cutting through a slight fog made it a mystical morning. 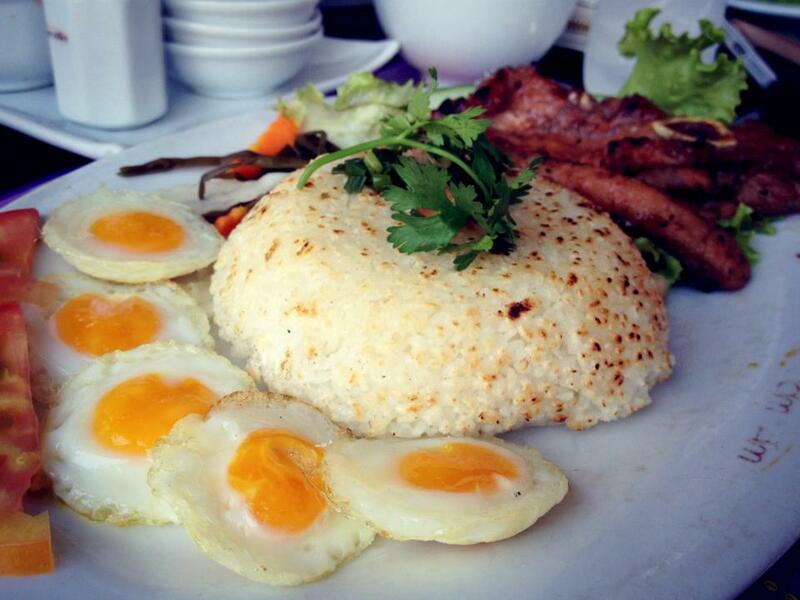 After mass, our family took us to get broken rice with pork chops – which usually comes with a sunny-side up egg, but this one came with sunny-side up quail eggs. This small wonder excited me greatly. Phuong Lam is a very countryside part of Vietnam, but was an obligatory trip for us since my sister had to go pay her respects to her father-in-law. And while I can’t say I was fond of no running hot water, the landscape there was so serene it made the stop worth it. We visited a malay apple orchard (where we picked the fruit to our delight) and ate lunch lakeside. The restaurant is famous for catching fish directly from the lake and cooking it on the spot. Deep fried fish spring rolls are quite tasty! Finally we made it to my hometown, where my grandmother was waiting for us. 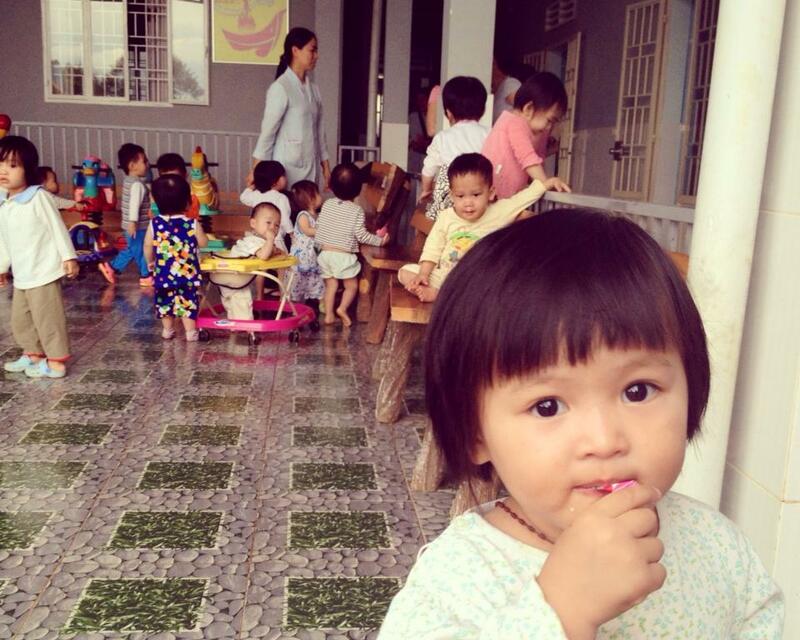 She’s quite possibly the cutest woman in all of Vietnam. She’s in her 80s (her real birthday is still the object of speculation), but still moves about strongly. I got to see our home again for the first time since we left in 1991; and with the renovations, I didn’t recognize it one bit. But what a gorgeous house it is! It’s three stories high, and has a great rooftop deck. If we had more time, I would’ve had to get some patio furniture and throw a party up there. I got to see a lot of family members I hadn’t seen since I was five, and met some new ones. Everyone was so friendly, and went out of their way to make me feel welcomed. We ate, hung out at coffee shops (Vietnamese folks really like their coffee shops, and will find any excuse to go there), visited my deceased grandparents’ graves, and got to see some hillside scenery. 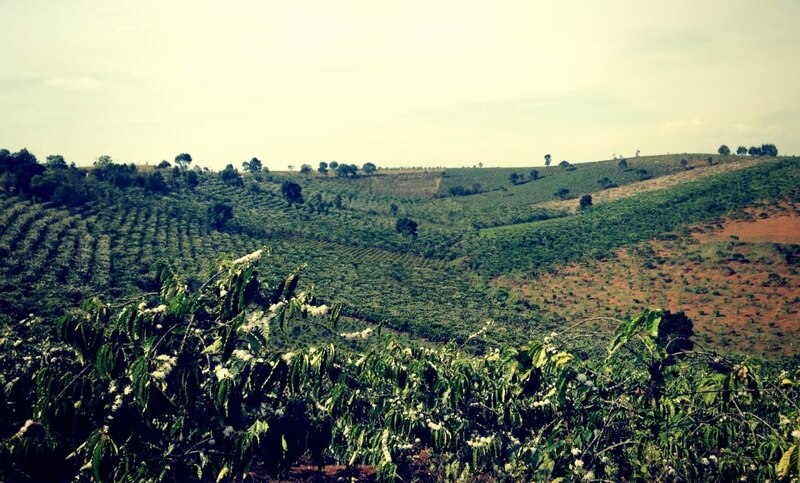 Bao Loc is famous for its teas and coffee, and the hills boasted just that. A short drive away is the Dambri Waterfall. Even though it was a low water-level season, it was still a sight to be seen! 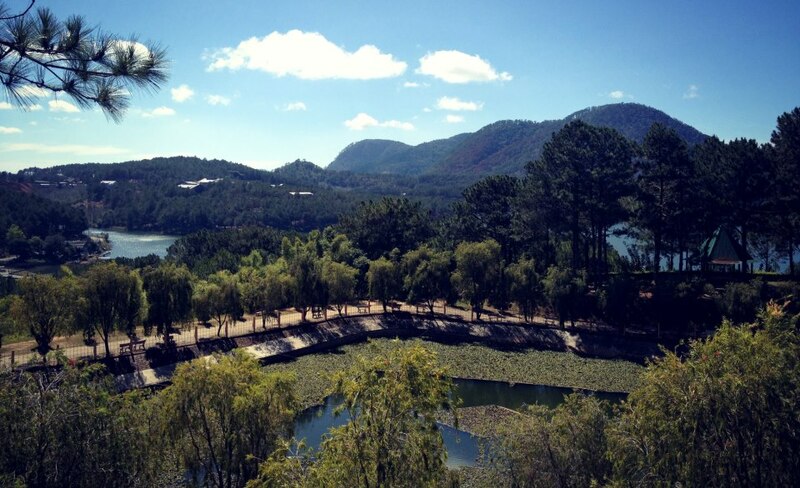 North of Bao Loc is the mountainous city of Da Lat. While driving towards the city, we could smell the fragrant pinewood burning in the distance. The weather there is always cooler, but I definitely still preferred it to the unbearable cold of Korea’s winter. We ate pork patty spring rolls (nem nuong) and shopped around in the open market. I got several sweaters and scarves for a great price! The next morning, we visited the legendary Crazy House designed to look like an organic building that grew directly from the ground beneath it. The designer is an older Vietnamese woman that’s still alive. Her creative genius is definitely well-appreciated by both local and foreign tourists. We also took a cable-car lift to see the entire city and got some great photos. There was a quick visit to a temple overlooking the city’s natural terrain, and then we were on our way. Nha Trang is currently my favorite spot out of all the cities I visited while in Vietnam. Perhaps it was the stark contrast from the barren tundra I just came from, or maybe it was the beautiful beaches calling out my name. It was the perfect escape. We got a room at a beachfront hotel, which made for gorgeous morning views of the sun rising over the beach. We rode a cyclo to eat seafood at a local restaurant. The crab was amazing! The next morning, we rented a boat to take us across the waters to a private resort island. For such a nominal entrance fee, the island is well worth it! There are several recreational choices: mini golf, swimming pool, a live band, jet skis, tents with mattresses for naps, and of course, the private beach. It was unseasonably cool for Nha Trang, so ocean swimming was out, but the HUGE pools on the island were a great alternative! After we’d exhausted all physical effort, it was time to eat! Our boat took us to a nearby floating village, where we chose our own fish from their locally-grown lot and feasted like sea gods. By the time we got back to the hotel, we were all so drained a nap turned into a sleep. We all woke up the next morning not knowing what happened. A quick breakfast and we were off to see a few more sites before departure: the famous villas in the hills that once belonged to the last emperor of Vietnam, Nha Trang Cathedral, Ponagar Temple, and my favorite: the Hon Chong promontory. We made a quick stop in Da Lat on the way back home for some nourishment. Unfortunately for me, the street sandwich I had eventually made me sick. I spent the entire next day in bed loading up on medication and water. On Monday, I was well again. My sister took me to a couple of orphanges she had visited the day before. We brought them clothes, dried foods, and snacks. While it was sad, it gave me great comfort to see the kind of care the nuns were giving the children. I visited the rest of my family, had two more dinners, and we left for Can Tho early Tuesday morning. We made it to Saigon by late morning, got a hotel room to rest for a few hours, ate and continued driving towards Can Tho. Can Tho is famous for its floating markets, where every fresh fruit in season is sold daily. We had to wake up early to take a boat to the market – early enough to see the sunrise as we were riding out. 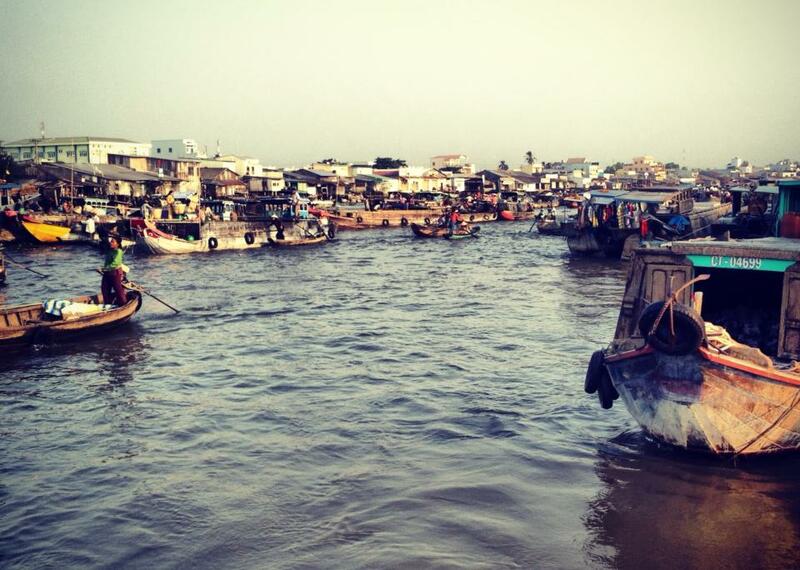 As soon as we reached the market, we were immediately bombarded by boats wanting our business. We bought a few things, and then docked at a fruit cafe. We got tea and ate so much fruit, I was surprised my stomach didn’t go into relapse. My trip was closed out in Saigon. We spent another evening there, and ate at a lounge/restaurant. It’s interesting to see a modern twist on authentic Vietnamese food. A Buu has a restaurant downstairs with live music, and a club scene thumping dance music upstairs. It was interesting to say the least. I spent the next day getting final gifts, ate anything else my heart could’ve desired, and caught the red-eye out of Ho Chi Minh City. 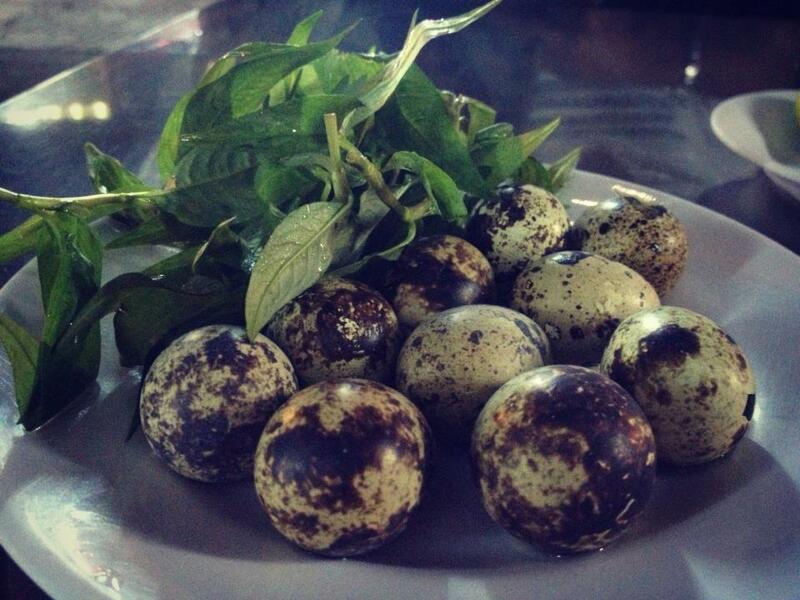 Oh yeah, right before I left, I ate 30 “balut” quail eggs. I am both ashamed and proud of this feat. Vietnam was so many wonderful things. My mom scared me with all kinds of cautionary tales, but everything was safe enough. All of my family members were warm and hospitable. Every city I went to was more beautiful than the last. I can’t wait take Clint with me next time! Cutest grandma in the world! Great set of pictures!! One of my favorite countries to indulge in the cuisine.